It’s always a great feeling when you see that the number of people following you on social media. It shows that people are interested in what you have to say, and want to see more. Unfortunately, not all followers are equal. You don’t benefit when somebody simply reads your content and then takes no action. 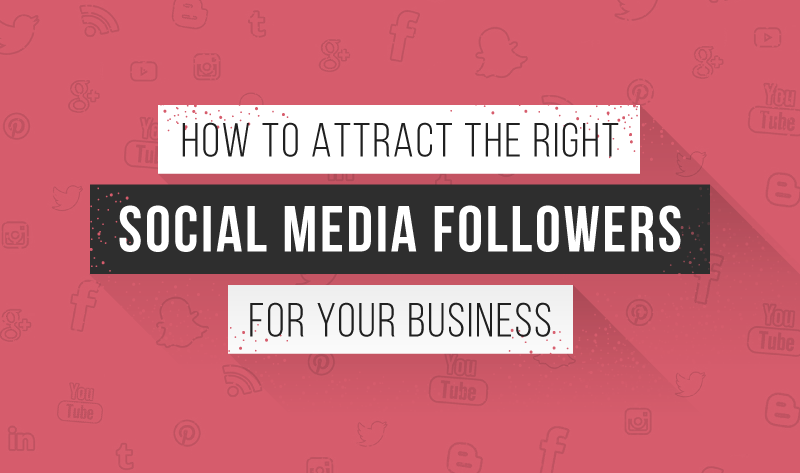 This is why attracting the right followers is much more important than simply getting any and everybody in your social media pages. You want followers who will potentially purchase your products and services, share content, participate in conversations, and answer your calls to action. The trick is knowing how to attract them. You already know that your target personas are the people who are most likely to buy your products and services. However, knowing that is not enough. You have to divide them into demographic groups, and also learn about their online behaviors, what they care about, what their interests are, and the likelihood that you can reach them. You’ll also want to know where they are online. Finally, if you can identify a group that would benefit from your product or services, that neither you nor your competitors are reaching, you may have found social media marketing gold. When you choose the social media platforms that you will focus on, there are several things to take into consideration. First, you want to make sure that you are focusing on the platforms where your customers and potential customers are active. Then, you want to select platforms that are the best fit for your business. For example, if you are a travel agent or own a design firm, you probably want to focus heavily Instagram. Finally, you want to limit your social media footprint, in accordance with the time and manpower you have to actively participate on each platform. You already pay attention to what your competitors are doing with regard to other aspects of marketing and advertising. Social networking is no different. Take a peek at their social media pages to get a handle of the campaigns they are running and what does and does not seem to be working for them. You certainly don’t want to create a carbon copy of what they are doing right, but you can definitely gain some helpful insights. You may even identify some customer personas that you hadn’t previously identified. Consider dividing your social media efforts into two categories. The first category is all about consistency and presence. This is rewarding your followers with content that they want to see on a consistent and regular basis (more on this in tip 5). The other portion of your social media efforts should be in the form of laser focused campaigns that target specific customer personas to follow, share, engage, and convert. Here’s an example, if you work as a general financial advisor, your target personas might include people of any gender, who earn money, and have money to invest. However, if your social media campaigns focus on such a large and generic group, they’ll be too large to properly manage, to large to measure, and they won’t be very effective. This is why it is important to identify smaller groups to target with each campaign. For example, divorced women over forty who have are new to handling their own finances could be the focus of one campaign, while newly employed graduates could be the focus of another. When people know that you are directing your efforts specifically at people like them, it helps to increase trust. This makes it more likely that they will respond positively to your campaign and participate in any engagement that you create. Infographics - Easily consumable and appealing to a wide variety of people. Thought Leadership Posts - Great for B2B and for your followers in key decision making positions. Photographs and Images - Great for building trust and familiarity and promoting products. Interactive Content Such as Social Media Quizzes - Great for generating shares and conversation. Product Demonstrations - More likely to result in conversions than simple pictures and images. How-To Posts And Videos - Informative and educational content that helps your followers solve problems and establishes you as a trustworthy expert. Long Form Content Such as E-Books And White Papers - Another great content format for executives and decision makers. These are also useful for other consumers who are very close to converting. Don’t forget about content curation. You can really keep your content rich and varied if you share relevant content from trusted sources. Just be sure to provide proper credit. One of the reasons that you do not want to dive into every social media platform that is available to you is that you want to be able to engage in sincere, meaningful conversations with people who follow you, ask questions, and leave comments on your social media pages. If you are spread too thin, you won’t be able to engage beyond shallow, meaningless ‘thank you for commenting’ statements. Not every effort you make to attract and keep the right followers is going to work. This is why it is extremely important to use analytics and established metrics to track the efforts of your social media campaigns. Once you have these metrics, you can use them to determine what works and what doesn’t, and then develop better campaigns in the future. Just keep in mind that simply page-views aren’t enough. You have to pay attention to the measurements that truly indicate engagement, such as video play through rates.